Today, when you order "INSIDER by Jay Sankey", you'll instantly be emailed a Penguin Magic gift certificate. You can spend it on anything you like at Penguin, just like cash. Just complete your order as normal, and within seconds you'll get an email with your gift certificate. 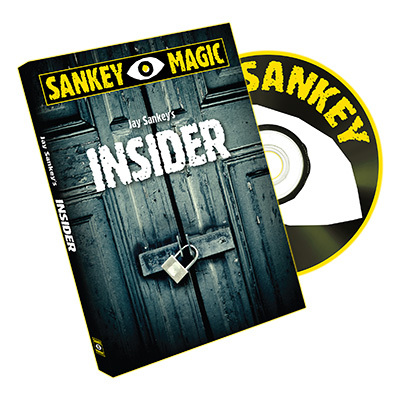 'INSIDER' is the next step in the evolution of 'impossible location' effects featuring a whole new world of extraordinary magic and mentalism with a wonderfully ORDINARY object: a window envelope. With the brilliant 'INSIDER' gimmicks you can cause playing cards, written predictions, dollar bills, business cards, photographs, paper napkins, baseball cards, book pages, letters, file cards and even a SIGNED PLAYING CARD to visually appear, vanish and transform inside a legitimately SEALED envelope! A card is selected from the pack. A moment later, the three other mates to the selected card visually appear, trapped inside the sealed envelope. Jay shares the secrets to using 'INSIDER' at your next childrens party, complete with a great gift for the birthday boy or girl! Brilliant effect. I love Jay Sankey because he makes you feel like you can do this instantly and you can ! The method is brilliant , and has my girlfriend still with no clue( and she usually works them out eventually).The best part is you're clean after you finish so people can scrutinize to their hearts content. The added shock of having something sealed inside a zip lock bag is pure genius!!!! !I would definitely recommend this if you get a kick out of transpositions and completely baffling people. I can't wait to start using this all the time , it's definitely gonna be one of my favourites!!!! A great trick from Jay Sankey. Very well done. Great stuff again from sankey. excellent gimmicks, materials and DVD. Jay goes through everything, history, development, every little subtle points, TONNES of ideas and even thoughts about shooting the DVD! Jay doesn't go overboard either with his explanations which he sometimes does. Unbounded (thought page in sealed envelope), the baggy, and the sign card are the 3 best ideas in the DVD. Even though the sign card version might not be as "clean" as some would've liked, but for real people, its absolutely killer. If you want a finish as visual as WOW, but examinable?? This is pretty darn close. Recommendation? get it. possibilities are only limited to your imagination and one way or other, you can add it to your repertoire. I ordered this, and as I watched the DVD more ideas that I could use this for kept coming. There's so many possibilities you could use this for. And the fact that it's completely examinable makes it even better. I tested it out on my friend, saying I accidentally sealed an envelope before I put the letter in, and it worked great. Jay does a great job of explaining every little subtle thing that you need to watch out for and even covers ways to use the same envelope over and over again. You won't regret your purchase: you'll definitely be able to find a way to combine it with one of your routines you're already doing or come up with you own routine using Insider. The effect has worked for me under many different circumstances. On the street, house parties, restaurants, etc. There are angles to worry about, but you handle that with practice. It's a simple trick to master, but does require a good bit of practice to really make it work the way it was meant to work! I love magic by Sankey, especially Insider, this is without a doubt a great trick that can be presented in so many different ways, you'll even come up with some of your own variations naturally, it really does give you that flexability, I don't even use the gimmick on this trick, he explanes things in a way that really gives you options, which is why I got more out of the demonstration video than the actual gimmick, this is a keeper for life!! !